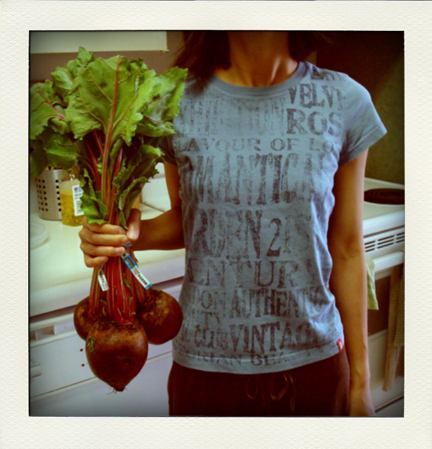 So we got the largest bunch of beets in the grocery store (they were sold by the bunch, not by weight). 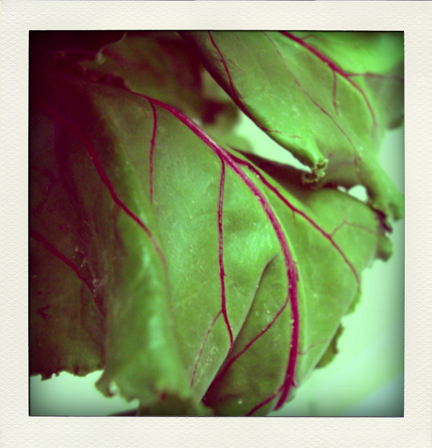 They had beautifully ruffled leaves with red veins. 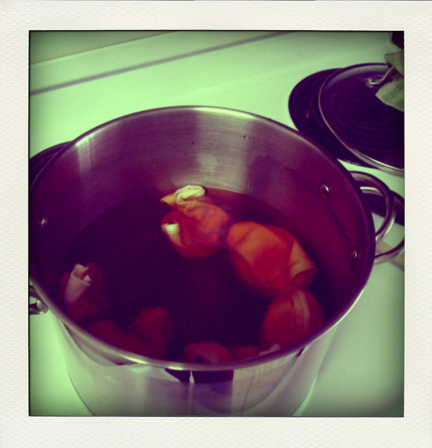 I cut and boiled the beets in a large pot. Even threw in the stems, because they looked really red. 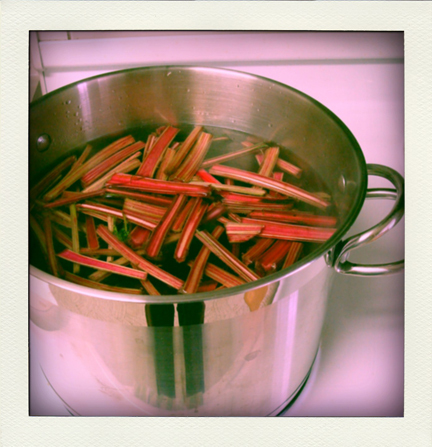 I boiled the beets for a long time — probably too long — so I could get as much colour out as possible. But that was probably why the cake in the end didn’t taste much like beets :P After taking the beets out I threw in a tied white cotton shirt and went on with the baking. It called for baking chocolate but I forgot to buy it. 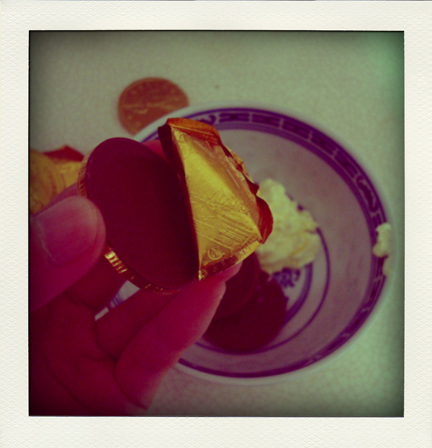 But we had chocolate coins! :D So I used those instead. 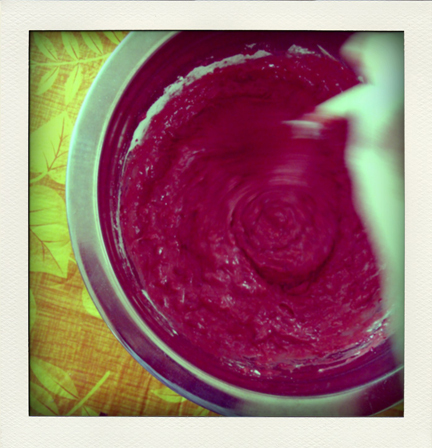 The cake batter was SO pink! While the cake was baking, I took out the shirt and let it dry on the clothing rack. I was pretty happy with the shade of pink. 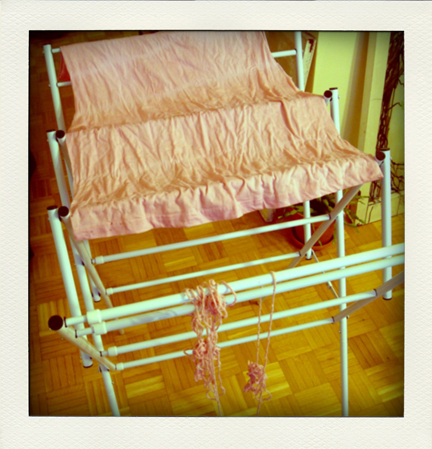 I also added a bit of cotton yarn to the dye bath half way through. Happy birthday, Mike! :D He liked the cake. 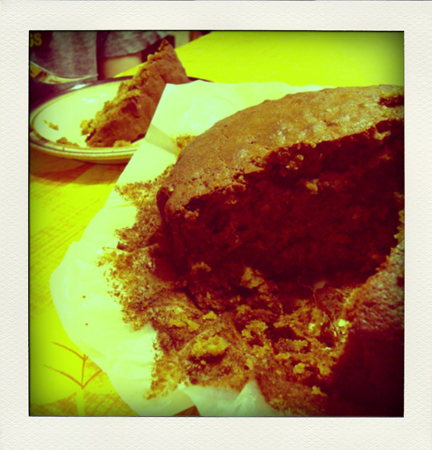 I think it tasted good, kind of like carrot cake. Just a bit disappointed that it wasn’t pink inside, and the bits of beets had turned into a shade close to that of raisins. 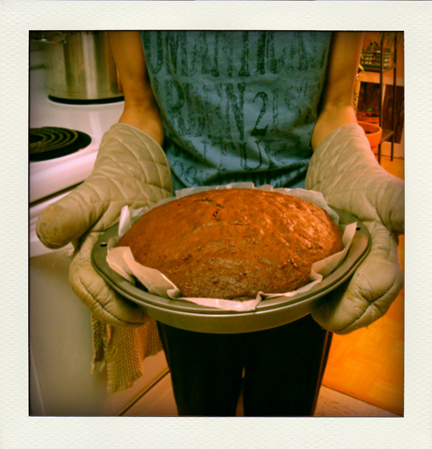 The recipe yielded quite a large cake. It stood pretty tall in a 9″ round pan. I probably could have made a smaller round cake and a loaf. We brought half to church the next day, and spent the next two evenings eating beet cake for dessert. It was good though! 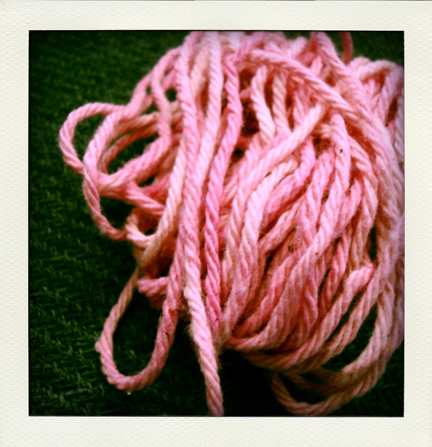 The yarn turned out with beautiful shades of pink after it dried. 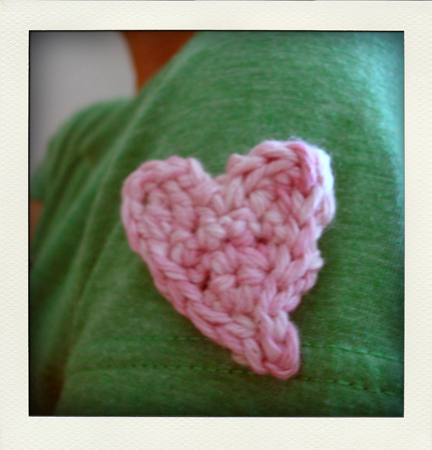 And with it I crocheted a free‐form heart. There’s no way I’m going to rinse the dyed yarn then. And the yarn doesn’t smell as much like pickled beets. Have a great start to the week, everyone! 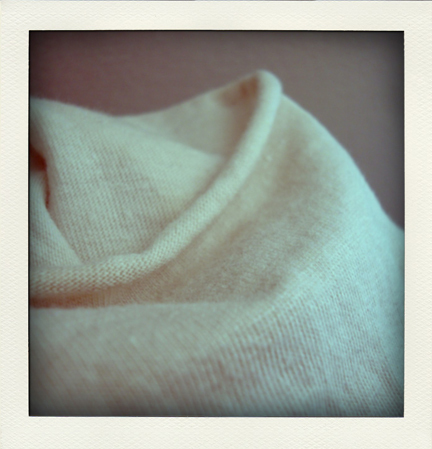 shirt dyeing — round two! That’s interesting that the dying didn’t work as well as we thought it would. Come to think of it though, I seem to remember that beet juice stains always came out of clothing fairly well…and remember how all the pink left my hands after I washed them well when you guys were over for dinner? The current trend is to use beet juice extracts to dye foods naturally (I’ve noticed it in a lot of product labels lately). But I guess it must not work as well for things you have to wash… haha, who thought we’d be complaining that stains come out too easily? yes! black tea was one of the dyeing agent. wine is just fermented grapes, isn’t it? so grape juice may work, perhaps? You had fun, that’s the main thing! And I bet you will continue with your dyeing adventures. I was talking to a 93 year old lady the other day who grew up in Norway; she said they would dye their yarn with onion peels and lychen. They raised the sheep, spun and dyed the yarn, and knitted sweaters, mittens, hats, etc. Henna (//en.wikipedia.org/wiki/Henna) is a good dyeing agent and comes in possibly three natural colours — red, black and indigo(not sure if indigo and black are actually from the same plant). 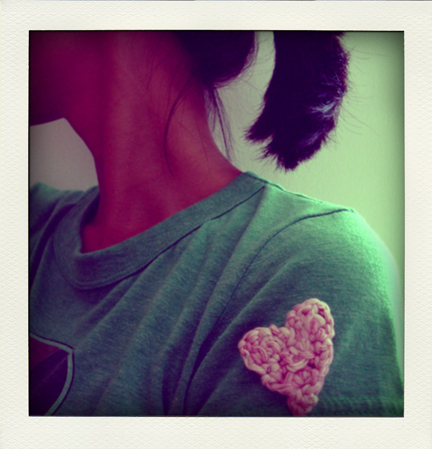 I dyed my t‐shirt once back in college with the natural red henna and it turned out quite well. Try it if you can! Henna is really cheap in India and relatively cheap here in the UK.